When talking about anchor text, we are concerned about two areas of SEO – Anchor Text for Internal linking and Anchor Text for Backlinks. Both can get you into trouble if you over optimize. But, using anchor text wisely can give your SEO campaigns much-needed power in relevancy. That’s the key word here – to use your anchor text wisely. How important is anchor text for Backlinks? Anchor text is very important when it comes to your backlinks. It can add relevancy to your pages by using keywords and keyword phrases and variations. But anchor text for backlinks in 2017 and beyond is more important in the sense of sculpting your anchor text distribution to appear more natural. If you have a completely natural link profile such as links earned from outreach and editorial links (i.e. links you don’t control), then you don’t need to worry about anchor text at all. Google will be able to tell that the anchor text and your link profile is completely natural. However, if you are actively building links alongside the naturally earned links, you want to make sure all your anchor text distribution looks natural. One of my favorite SEO tools, Serped has a great backlink profile tool, among other tools. In 2017 and beyond, it is getting more and more important to have a natural looking link profile. With Google’s Penguin now running in real time, it is even more important to keep an eye on your backlinks. Having a natural link profile requires many things to fall into place and your anchor text distribution plays a major role in that equation. So why is anchor text important for backlinks? One word. Relevancy. Let’s say you have an e-commerce store that sells 3D printers. Let’s say you specialize in portable 3D printers and you become an authority in your niche on portable 3D printers. Over time, you get a lot of backlinks from people with the anchor text: Portable 3D Printers. Google sees many other trustworthy websites in the same niche that are linking to your site with the anchor text of “portable 3D printers.” Naturally, Google is going to think that either you are really relevant for that keyword, or it will decide it looks unnatural. If it was truly natural, you don’t need to worry about it, since Google should be able to tell the difference. Many SEO had experienced a lot of success using this popular tactic. It was so powerful that there were even viral “Google bombs.” A Google bomb is where a lot of webmasters link out to a webpage with a particular anchor text, in hopes that it would rank for that keyword. Sure enough, his page ranked #1 on Google. Pretty great right? 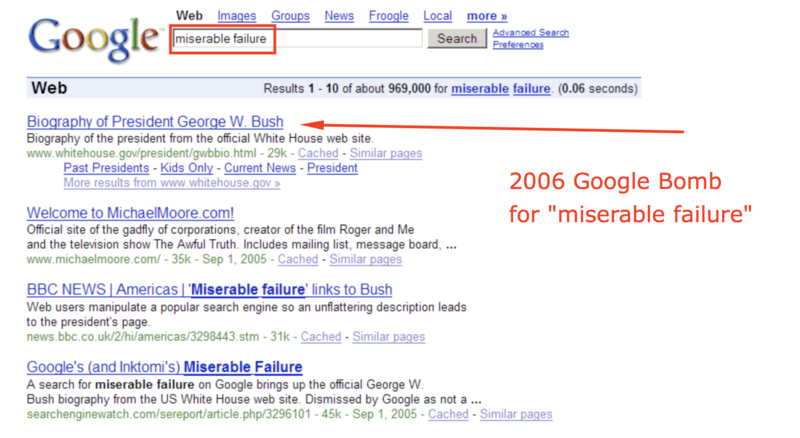 There are many more examples, but the George bush google bomb is probably the most famous. Google soon put a stop to the Google bombs in 2007 by adjusting their algorithm to prevent this phenomenon. It was the pre-2012 era in SEO that a keyword heavy optimized anchor text distribution worked amazingly. And by the way, pre-2012 in the SEO world is like back in the agricultural revolution in our human history (10,000 years ago). A lot of paradigm shifts happen in 5+ years in the SEO world. Before 2012 an anchor text profile that had a lot of exact match keywords was preferable (i.e, if you are trying to rank for “iPhone cases” and the exact match anchor for that keyword, is “iPhone cases”). However, in 2012 Google Launches the “Penguin Update” Targeting Webspam In Search Results. This changed the way good SEO was done forever. Naturally, lots of articles came out warning of the “Google over optimization penalty.” People were starting to see their site’s rankings being affected by having too many keywords in their backlink profile. What happens in SEO, is if there is some technique that is powerful enough to manipulate the search engine rankings, word will spread. Then the “technique” will probably become a widespread practice in the SEO world. In which case, Google needs to address in their algorithm – a never-ending cat and mouse game. This was the case with the keyword rich anchor text profiles. What happens though, is Google catches on and tries to prevent the manipulation of the rankings by SEOs. They added an “over optimization” aspect into their search algorithm to prevent people from abusing this powerful force in achieving rankings for particular keywords. This over optimization penalty makes sense though, right? Think about it. Most people are going to link to your website with your exact URL, your brand name and a wide variation of phrases, which may or may not include your keywords. So on a natural backlink profile, the exact match anchor text may comprise a very small percentage of your overall anchor text distribution. Where many SEOs go wrong is they are stuck in 2008. I am still surprised to see many people over optimize their backlink profile to death. And death is a correct description for this. It can absolutely kill your SEO efforts if you go crazy with it. They tend to overdo it and they get greedy with their keyword rich anchors. They have a site with 100 links and half of those links are “carpet cleaning [city]” or whatever they are trying to rank for. This looks totally unnatural to a trained SEO, so why wouldn’t it look unnatural to Google’s algorithm? Keywords should be like your salt intake. You just sprinkle some on your food, don’t pour half the bottle. It’s not going to taste very good for the Google algorithm or your long-term business strategy. You’ll notice that there are many types of anchor text. There will be certain distributions of a combination of these that appear natural to the google search engine. If you are to go outside of these bounds, your site may appear to be involved in manipulative link practices and Google will adjust rankings accordingly. This is where anchor text becomes very important for your overall backlink strategy. You need to keep it natural. When you add too many exact match keywords and keyword stuffed anchor text, it can actually harm you. In economics, there is a phenomenon known as diminishing returns. This concept applies to the usage of keywords in your anchor text. There is diminishing returns when using keywords. At first, adding keywords may begin to help your SEO performance. But as soon as you pass a certain threshold, it stops adding as much benefit. Then you push past another threshold and it will likely trigger something in the algorithm that views your site as having unnatural links. Rather than focusing on optimizing for keywords, you should be focusing firstly on creating a natural link profile. Ideally, it will be truly natural, but at the very least you should make it appear natural. This would include making sure your link profile has plenty of branded anchor text, plus naked links, variations of anchor text, etc. You can essentially pick a top performing site in your niche or a competitors site and reverse engineer their link profile. Chances are, they will have a natural looking anchor text distribution that you can copy. If not, pick another random site that has a very natural anchor text profile, and mimic theirs. You still want to optimize your backlink profile and this includes honing in on your keyword distribution. Just don’t go crazy with it. Remember, the key is to maintain a natural looking profile. This would mean you are keeping exact match keyword anchor text to a minimum, and also throwing in variations of keywords, etc. If you are building links, and you build them in a way that creates a natural link profile, you should steer clear of any potential issues with Google. Google’s new real-time penguin, baked into the main algorithm essentially allows the cream to rise to the top, rather than penalizing sites. Whereas before, you would get penalized. And guess what, if your anchor text in your link profile looks unnatural, other sites can rise to the top, leaving you in the dust. Previous PostReverse SEO - What Is It And How Do You Do It? Solid anchor text information here. 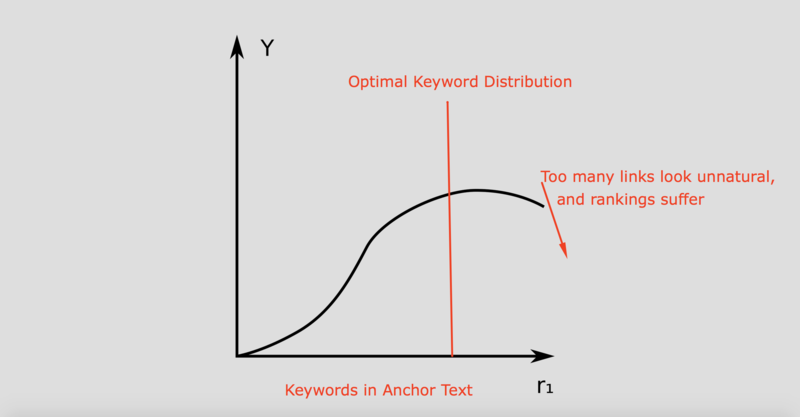 Anchor text might be one of the most important factors in link building. Keeping your link profile clean is a must, but there is also a very high need for keyword specific anchors. Using Keyword specific anchor text is like the secret sauce and can only be used on certain websites. My advice is to use keyword specific anchor text on high page authority/ domain authority websites. By utilizing high pa/da websites for your keyword specific anchors, you are really boosting your target rank for that phrase. Anyway, thanks for putting this one together! Great tip Brenan! I’d even go so far as to say the higher the trust ratio + DA, the better for using those as your keyword specific anchor text. Google would likely trust those more, as opposed to keyword stuffing lower quality links. Makes perfect sense, thanks for you input! Creating a natural link profile should be the priority when we are building an anchor text cloud. Using the different types of anchor texts as you mentioned in the post will definitely helps our link profile look natural. Really informative post here on link anchor text and very well described. Jeffrey, you are absolutely right, over optimized anchor texts can call the Penguin penalty to the site. The point is diversification. We have to diversify our entire anchor text profile so that it goes natural. Branded anchor texts are the safest, and powerful too. If we have to use keywords in anchor texts, we have to mix those with different types of relevant keywords. Hi Soumya, Thanks for your comment. I definitely agree! Hey, great post. Through my research I’ve noticed a lot of sites that are on the first page have a high ration of blank anchors, which is weird. The blank anchors are mostly overlooked by many SEO’s etc. Thank you for the informative post. Thanks, definitely, and it does all depend on the niche/ keyword. Its all about what is natural – and noText (empty) anchors are very natural, especially from image anchors. I attended a conference by a reputed SEO guru. He mentioned that google doesn’t care about the optimization of anchor text of internal links and told us to not to worry about it. I found these sites apkpure , apkmirror , apkmonk aggressively using keywords in anchor texts and doing very well on serp. Do you have any evidence (case etc ) supporting your theory? I’ve always said that SEOs are like economists, we all have our own opinion. In a complex system with many changing variables and no handbook, we all learn from each-other, experiences, intuition and theorizing. I’ll be the first to admit nothing I say is a fact. It’s all theory. Much of SEO is theory since Google keeps their algo close to their chest. With that said, the concept of using internal linking with keywords is a very basic, well established SEO strategy that many, many SEOs have used for a long time and continue to use it today. I am surprised a “guru” would say don’t worry about optimizing internal links. If I went to a conference and heard someone say that, I would personally question them as a source to listen to. But like I said, everyone has their own experiences and opinions in SEO. I wouldn’t take everything one person says as gospel. Further, you shouldn’t listen to every “guru” because they don’t always get it right. I’ve been learning SEO for over 10 years and am beginning to realize that many of the Gurus aren’t actually world class SEOs. Some may be. But not all. Also, nobody gets it all right (myself included). Pick and choose what you like from other people, think for yourself, and test. As far as case studies, you won’t get a lot of these from most SEOs. The reason is because the sites are often confidential (if a client site) or SEOs don’t want to publicize their personal sites and niches. I wouldn’t necessarily want to let a bunch of other SEOs know what niches/ sites I am involved in because those are my livelihood and I wouldn’t want to inadvertently create a bunch of copycats and thus competitors. Thats what naturally happens. When lots of people see a niche being showcased, its more likely to attract competitors, even though there are an infinite amount of great niche opportunities out there. That’s one reason though why I don’t do a lot of case studies, and why many other SEOs don’t. Though they are very interested and I love to read them when I find them. there is one in particular that I have been meaning to cover. It is actually dealing with the over-optimization of keywords in the internal link’s anchor text. I know I am “Pro Keyword” in internal links, but you have to do it intelligently (which I believe significantly helps), otherwise it can be risky. I am confident that over-optimizing internal linking and on-page can significantly hurt a site, since I’ve seen it several times. I’ve seen a decrease in traffic up to 40-60%. And I’ve seen the recovery after resolving the over-optimization, where the traffic went right back up to normal levels. It can potentially harm rankings to over-optimize if you do it way too much (though not all the time). It’s all a very fine line between UX/real user satisfaction and satisfying bots. So yes, I do have a case study I’ve been meaning to publish dealing with over-optimization, however, because it was a friends site, I may not be able to get into the nitty gritty of the specific keywords, etc. So, I am absolutely confident that Google can de-rank a site for over-optimization of internal links (well thats not the right word, its more that the cream rises to the top in Googles eyes), but the point is, keyword rich internal links has potential to harm a site if done too aggressively. So think about this: Google tends to target aspects of SEO where the SEOs are abusing and receiving an unfair advantage. Google really wants to level the playing field between SEOs and Non-SEOs. Google wants the best content to rank, naturally. Google doesn’t want some mediocre content ranking over the actual best piece of content, because the mediocre content was optimized by an SEO. One example where SEOs had an unfair advantage and used to work really good is a keyword rich backlink profile. This is now a long held SEO risk. But it used to work great. It actually still can help a site, but has to be done very moderately. Google targeted something that worked great (keywords give relevancy signals to site). But people abused this, so Google tweaked the algo to actually harm you if you overdo it. They did the same thing to internal linking. So that tells me that using descriptive keywords in your internal linking WORKS, but now you have to be careful not to do it aggressively (too much exact match). You need to do it naturally, otherwise it may hurt. But if you do it intelligently and for the user, I am telling you, it is a very effective on-page SEO strategy – at least in my experience. The only difference between old SEO and today’s SEO is you have to vary the keywords and make it more natural, not focusing on exact match (instead focus on natural and longer tail/ longer sentences including part of the keyword).